Small complex areas can be verified by zooming and rotating the piece without having to perform the rendering again. NEWLY released PEPS WIRE version 5.3 has the ability to work with solid models that can be imported, viewed and manipulated in PEPS. CAD drawing and model data can be imported using industry-standard file formats DXF, DWG, IGES, X_T, VDA, STL, STEP, CATIA, PRO E and SAT. It is available from Camtek Pacific . A Design option is also available that allows CAM Models to be created or modified for subsequent use. PEPS Wire EDM includes a fast and effective 'Repair Drawing Option' that is very important for Wire EDM. Selected items or the entire drawing can be checked and corrected in seconds. Drawn in or imported geometry is used to create 'Profile Figures' ready for the application of cut technologies. 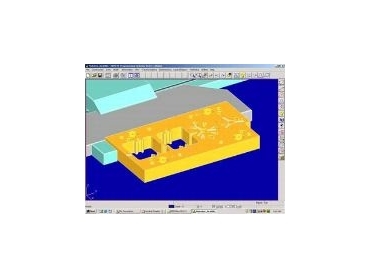 Profile Figures are used whether a single component profile or no-core section is being programmed or as Upper and Lower sections for 4 axis machining. Cutting technology data is supplied for many machine tools and is imported into a PEPS knowledge base. The knowledge base cutting scheme can then easily be applied to the shape to be machined providing offset, power and other EDM cut parameters to the part and finish requirements. Profile Figures include wire thread positions. Wire thread positions can be generated automatically and are fully under user control. As slugs become detached by cuts, the simulation advises the programmer this is the case and graphically removes the part, emulating exactly the cutting process that will happen on the machine tool. A Multiple Tags feature is used when a part requires multiple tags to secure the slug or punch. PEPS allows you to give it multiple start holes and it will automatically establish tags prior to each new start hole location. Automation of Unattended Machining allows the user to select from several different methods of unattended machining. If a machine is equipped with automatic wire threading, then it will most likely want to run unattended as long and as often as possible. Unattended machining is performed by leaving the slugs attached while all of the preliminary cuts are taken. You may choose to take all of the rough cuts before finishing, in which case all rough cuts are taken while leaving the tags attached, then the tags are removed, and finally the trim cuts are taken. The rough and finish cuts can be chosen while leaving the tag in place and then to remove the tag and trim this area. Implementation of the selected strategy into NC program is done automatically. Skim Cuts are automatically programmed. As machining speeds increase No-Core Machining of openings becomes efficient and small openings can be finished completely unattended. In certain cases there may arise a need to change the power and/or offset settings as the machine proceeds around the shape. With PEPS the user can graphically select a location for this type of change to take place and indicate which items should be changed. Solid Rendering allows dynamic zooming, panning and rotating of the machined work piece. This tool is extremely useful in advanced 4-axis work such as mould and extrusion dies. With the introduction of the new 'feature rich' Wire EDM machine tools and controls it is clear that new standards of 'offline' NC Part Programming would be demanded by sophisticated tool makers, mould and die makers and the general EDM jobbing shops. Camtek implemented functionality to support the capabilities of the complete range of Wire EDM machines and machine users. PEPS Productivity Enhancement Technology makes creating and editing programs for Wire EDM machines quick, easy and error free. PEPS supports all major Wire EDM machines including the full range of Agie with Tec Script Files for Classic, Challenge, Evolution & Excellence, Charmilles with Command Files, Mitsubishi, Sodick, Fanuc, Brother, Japax, Hitachi, Makino, Seibu, Ona and Exeron. PEPSWIRE V5.3 sets new software standards, in ease of use, functionality and programming productivity. The software is not an adaptation of existing CAM software - it is designed specifically to exploit the capabilities and versatility of EDM technology. Optional Gear Design (DIN/ISO and AGMA standards) and Turning Tool Design software further enhances benefits to the 'master' Wire EDM users. Unique capabilities, such as, full graphical editing of Variable Land heights results in PEPS being the premier software for the Extrusion Die Maker. High quality 3D solid simulation of the cutter path results in better programming productivity and reduction in programming errors. “We know PEPS WireCut Module for many years as working to full satisfaction of customers, especially for Agievision machines,” said Software Manager at Agie Ltd, Aldo Gilgen. Another substantial benefit of PEPS is it covers all NC machining applications.